“We provide solutions that really help make people's lives better." Dr. Zenton Goh, CEO of Cadi Scientific, a Singapore-based healthcare technology company, has worked through the years to ensure this ideology is followed in his firm--the quintessential reason for his customers to return every single time. The 14-year track record across the healthcare space is what helps them deliver incomparable solutions-- bringing desirable change in the healthcare sector. The combined insight of the co-founders has helped bring a new level of productivity to organizations that Cadi serves. With the need for hospitals today to bring in technologies that alleviate the worldwide shortage of staff and with the demand of implementing solutions to increase efficiency rising, Cadi has been working relentlessly to counter the pain points. “The core purpose of Cadi defines the character of Cadi, and that is to ensure that the solutions are really helpful to our users,” says Dr. Goh. The focus at Cadi is to contribute the best healthcare facilities with advanced technologies and solutions that really help solve their problems so that healthcare practitioners can focus on their main role - to take care of patients. Dr.Goh explains, “Cadi, Cadian (i.e., Cadi's staff) is like a caddie who off-loads the client's worry so that the customer can focus on delivering his best performance, and at appropriate times offers advice and advanced technology to help him achieve the goal. That is how we came up with the name Cadi.” The Cadi team has its expertise in wireless tracking, sensing and matching devices to automate and simplify the hospital processes. The Cadi team delivers a complete range of SmartSense solutions such as Asset Tracking and Management, Infant Matching and Security, Patient flow and bed management, Patient temperature and location tracking in the healthcare industry to cater to the needs of Hospitals. Cadi SmartSense solution is Cadi’s award-winning product comprising of a small wearable disc that tracks the patient’s location and measures the patient’s temperature throughout. Over the years, SmartSense has evolved to include wearable tags that match infant to their mother and tags for tracking equipment. “Cadi SmartSense solutions help in enhancing patient care, safety, operational efficiency, and facilitate Joint Commission International (JCI) accreditation and HIMSS Stage 6/7 Recognition,” adds Dr. Goh. Cadi SmartSense also reduces hospital acquired infections and assists in obtaining ROI regarding cost savings and workforce savings. The unique tag-to-tag matching technology that Cadi SmartSense features gives users a robust unsurpassed accuracy. More than 1.5 million patients in Singapore and the APAC region have used the RFID patient tags from the SmartSense system. For the infant safety solution, more than 90 percent of Singapore’s maternity and labor wards are using it today. Singapore General Hospital deployed SmartSense Infant Safety solution which ensures that the 'right baby' is brought to the 'right mother' also preventing 'babies' from being taken away from the maternity ward without authorization. SGH also leveraged the power of Cadi SmartSense technologies to optimize and automate patient flow from the point of admission to the point of discharge and reduced the time taken to get a bed from admission by three times. Samsung Medical Center (SMC) in South Korea is also one among the many companies that reaped the dynamic benefits of Cadi SmartSense technologies. SMC utilized Cadi’s SmartSense system in the year 2013 in its health screening center. This technology instantly reduced the waiting time thus enhancing the patient’s experience. “SMC is the world's first health screening center that uses an active RFID system (Cadi SmartSense) to minimize waiting time and automatically guide the patients to the various screening areas. Cadi SmartSense also helped SMC win the Medical Korea Awards in 2016,” adds Dr. Goh. 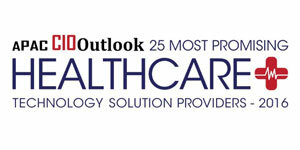 Cadi SmartSense system was awarded Microsoft Health Users Group Award in 2010 for its contribution to hospitals in the healthcare space. Keeping in mind the hospital requests and the changing trends in the healthcare space, Cadi is adding new functionalities in Cadi SmartSense system, such as staff-patient contact tracing and hand hygiene compliance monitoring. 'Staff patient contact tracing’ records the episodes of contacts between staff and patient and 'hand hygiene compliance monitoring' which help in reminding the caregivers to fulfill the ‘hand hygiene’ practices. Going ahead, Cadi aims to ex-pand its offices globally spreading its best in class SmartSense technologies to hospitals across the globe.